Are you always tossing the same back to school snack ideas in your child’s lunch box? I am guilty of that sometimes. As soon as I find a school snack that my daughter loves, I keep adding it to her lunchbox.. not good? I feel less guilty when the snack is a homemade one and a healthy one like this banana bread recipe: easy to make, healthy and most of all: kid approved. If school snack ideas are not kid approved, they are useless, even if they are the healthiest snacks ever. The following back to school snack idea is kid approved and mom approved: win win situation. We’ve included affiliate links to share supplies. 2 ripe bananas. I used frozen bananas. I usually freeze my bananas when they become too ripe and no one wants to eat them anymore. 1/4 cup of chocolate chips. I used the Hershey Sugar Free ones. In a large bowl, mix the wet ingredients. Then add the second mix to the wet ingredients. Pour in already greased bread pan. Bake for 30 to 40 minutes on 350F. What I love about this back to school snack for kids: easy to make. You can freeze it in individual portions and toss in the lunch box the night before. Of course the taste is way better when it is savored fresh with a cup of milk. As an alternative, you can pour the mix in muffin tins and it will be a banana muffin recipe. You can involve the kids in the baking or the decoration of this healthy snack. My daughter loves decorating what I bake. She is more eager to eat it when she does so. What do you think of this easy banana bread recipe? Do you have any other great back to school snack ideas? I have been looking for a banana bread recipe, thank you for sharing. My grandma would always make me banana bread in the Fall. I remember having it as an afterschool snack while discussing my day with her. I have never thought of putting poppy seeds into Banana Bread like this! I can not wait for this fall I miss baking breads and all sorts of goodies. Banana bread is one of my favorite ways to use bananas up. This looks like such a delicious and healthy after school (or even before school as breakfast) snack. My boys love to bake with me, and we always have overripe bananas, so this would be perfect for us. Can’t wait to try it out! This looks delicious! I’d love to come home from school to eat these. I’m sure the muffins would be a great idea too. My kids will eat anything, so I’m sure they’d like this recipe. This sounds so yummy! I think muffins using this recipe would be a great snack for school as well. I love to get new ideas for snacks and school lunches I feel like my son is always eating the same things. Thank you! Banana bread has always been a favorite of mine. I’m always searching for the best recipe, I can wait to give yours a try. I’ll have it with my morning coffee. Yum! That sounds fantastic! Banana bread is so delicious. I think I would replace the flour with whole wheat flour to make it more healthy. All that fiber combined with the potassium and complex carbs of the banana is a fantastic treat for a school day. I’ve always loved banana bread! It always go perfectly with my coffee, or with milk (for the kids). I haven’t tried to add poppy seeds though. The additional poppy seeds makes it more appealing and would add a great texture to the bread. I cannot wait to try this! i love banana bread in general but poppy seeds are a new addition. i wish i had a slice or two right now with me. Banana bread is one of the few things I bake that my picky kids will actually eat. They love it! I’ve never tried it with poppy seeds, but I’ll bet they add a really nice taste to them! I love making my own bread, and banana bread is a frequent go-to. Thanks for sharing your recipe! I love banana bread and it was always a favorite after school snack for me when I was a kid and for my own sons. This recipe looks awesome. Banana Bread is one of our favorite snacks. I have never made it with poppy seeds before. I will have to try this recipe – thanks! The kids home starving! I know they would gobble this up so quickly. It sounds awesome. 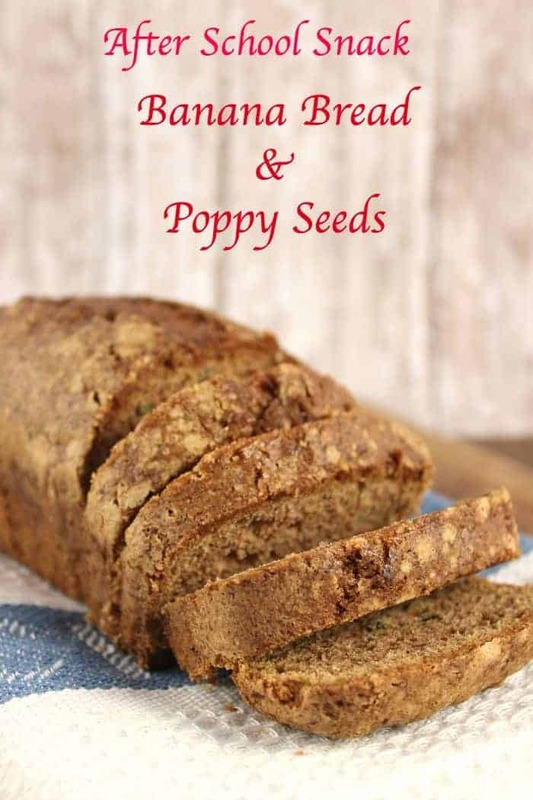 I love banana bread, but I’ve never tried it with poppy seeds. What a fun twist on a classic recipe! This banana bread sound healthy and delicious. would make it for me except I am allergic to bananas!! I am sure all the children would love to find this in their lunch boxes as a snack!! hmm sounds delicious,,I love banana bread,,think I will try this! oh thank you for the recipe! I never would’ve thought of poppy seed in banana bread! Banana bread is a fabulous on the go breakfast too. Thanks so much for the recipe, my gran daughter is at our house after school and she always wants a snack. this banana bread sounds wonderful and I think we would all enjoy it. I have 7 little grandchildren that I bake for and they will love this banana bread when they open their lunches.Thanks so much for posting this. Oh my this sounds so good!! I bet my family would love this!! I love healthy, homemade snacks that I can put in my kids’ lunches. This sounds really tasty!